Lock in a great price for NangYuan ViewVilla – rated 8.4 by recent guests! NangYuan ViewVilla is a villa located in Ko Tao, 0.9 mi from Nangyuan Island. Featuring free private parking, the villa is 1 mi from Mango Bay. Free WiFi is offered throughout the property. Guests can indulge in the infinity pool or relax at the spa on site. Yoga classes can also be enjoyed. There is a seating area, a dining area and a kitchen as well as a private bathroom with bathrobes and slippers. A flat-screen TV with cable channels, as well as a computer are featured. Guests can play table tennis at the property, and the area is popular for snorkeling. Mae Haad Pier is 2.1 mi from NangYuan ViewVilla, while Sunken Ship is 3.1 mi from the property. A number of activities are offered in the area, such as diving, cycling and fishing. Samui Airport is 42 mi away. Sairee Beach is a great choice for travelers interested in beach walks, sunsets and beaches. When would you like to stay at NangYuan ViewVilla? Our recently finished four bedroom contemporary detached villa has uninterrupted breathtaking views across to the beautiful island of NangYuang and the gulf of Thailand. The villa faces westerly and boasts the most amazing sunsets, and is the perfect retreat for couples, families and friends. The NangYuan ViewVilla is close enough to enjoy the nearby beach of Sairee and Sairee Village, but far enough away for those guests wanting a quiet and peaceful/relaxing vacation. For an additional cost we can provide in-house massages and spa treatments to be taken on the upper level massage terrace. We also can provide yoga sessions on the upper yoga terrace overlooking Nangyuan islands. Introductory divIng lessons are also available by request. A range of cuisines can be delivered to the villa, and for a special occasion we can arrange for a private chef to personally cook for you, Asian or Western food. Koh Tao boasts many activities and sports; the most popular being scuba diving and snorkelling. Guests can also charter a fishing boat or take a boat tour around the island, stopping off at some of the most beautiful beaches in the world. From rock climbing and bouldering to yoga and hiring a traditional long-tail boat around the island, there are plenty of things to do. There are an abundance of traditional Thai restaurants as well as Western eateries to cater for all tastes and budget. 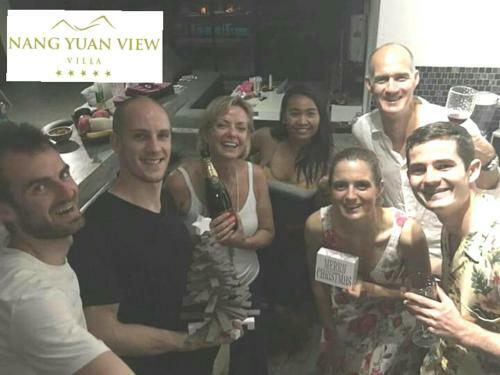 House Rules NangYuan ViewVilla takes special requests – add in the next step! A THB11000 damage deposit is required on arrival (around USD343.59). This deposit will be fully refunded at check-out, as long as there isn't any damage to the property. Please inform NangYuan ViewVilla of your expected arrival time in advance. You can use the Special Requests box when booking, or contact the property directly using the contact details in your confirmation. A damage deposit of THB 11000 is required on arrival. That's about 343.59USD. This will be collected as a cash payment. You should be reimbursed on check-out. Your deposit will be refunded in full, in cash, subject to an inspection of the property. A fantastic week spent here in January with some family and friends. The villa is gorgeous and has the most breathtaking views of the Nang Yuan islands and we enjoyed many evenings watching the sunset from the pool. The facilities are excellent and an excuse not to go far as you have everything you need in the villa. We did a food shop once or twice to ensure we had plenty of supplies as you are quite far up the hill. Although with bikes this is only a short trip. Gary was a very friendly, accommodating host. The pool was cleaned every morning and we also received House keeping during our stay. We were also transported to and from the villa upon our arrival and departure which was great.